Get FREE installation on your 24-month Go UNLI Plan this Easter Sunday! *Promo valid on April 21, 2019 only. 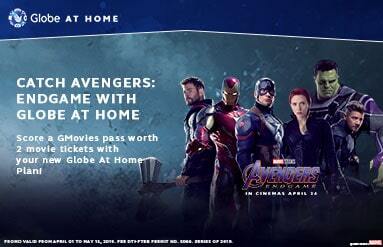 Buy a Globe At Home Prepaid WiFi and get 4 Avengers: Endgame tickets! *Promo valid until April 24, 2019 or until supplies last. Get your smoothie fix with a P200 Jamba Juice Gift Card, FREE with every approved ThePLAN PLUS application! *Promo is exclusive to new line applications until April 22, 2019 only. Keep everyone in frame with the FREE Huawei Selfie Stick that comes with Huawei Nova 3 and ThePLAN! *Promo is exclusive to new line applications until supplies last. Complete your summer essentials with the FREE Tumbler that comes with ThePLAN 1299 and up! *Promo is exclusive to new line applications until April 30, 2019 only. Score online exclusive freebies when you get a Huawei phone with ThePLAN. Globe Mobile Postpaid Subscribers who apply for a Globe At Home broadband plan get FREE installation! *Promo is valid until June 30, 2019. Track your fitness goals with the FREE Mi Band 2! *Promo is valid until supplies last. Get your dream phone with no cash-out or credit card via our 24-month installment option! Get a FREE Belkin MixIt Lightning Cable for every purchase of any Belkin charger. Keep the magic alive and enjoy 20% OFF on our Disney Collection! Get a FREE phone cover worth P2,999 when you buy a prepaid Samsung phone! Get exclusive freebies with your prepaid Huawei phone when you buy from the Globe Online Shop! Pair your Go Unli plan with the perfect device with these new bundles! Mix and match your new outfit with these marked down apparel steals. Whether you’re in the market for a broadband or postpaid plan, or looking for some new clothes and gadgets, this is the place to be. Shop for the latest promos and offers from Globe here at the Globe Online Shop Deals page! Discount hunting has never been this easy. You can find deals here that you can’t find anywhere else! The Deals page is home to all Globe online exclusive discounts and sales ranging from Globe At Home rebates to 917 apparel sales. Get your home connected or fill out your wardrobe with Globe’s hottest deals! We’re also always offering new postpaid and prepaid cellphone deals and offers! You could score some freebies like movie passes or headphones with ThePLAN PLUS, or get your new prepaid phone 50% off! Enjoy some of the best online deals in the Philippines with Globe! Shop your heart out here at the Globe Online Shop and get access to endless broadband, postpaid, prepaid, apparel, and accessories deals!